Welcome - Come and learn. Inquire and explore. This space has been designed to support the inquiry process for educators to delve deeply into the digital storytelling. Framing an exploration using the inquiry model will support adult learners, but also explore how to apply inquiry into digital storytelling into the classroom. This is a web site was developed and designed to support a presentation for ECOO BIT15. It is designed as a space for educators interested in learning, connecting and supporting educational technology using digital storytelling. 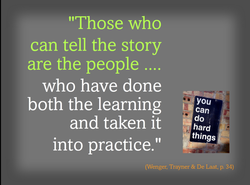 I hope these pages will continue to model, support and connect you to the potential found in Digital Storytelling (DS) as a purposeful way to engage students with learning while using digital technologies. Navigate through this space by using the pulldown menu tabs found at the top of each page.